Use Perfect Property to find your next perfect house to buy in Newcastle. Newcastle is a lovely town located 25km southwest of Dublin’s city centre. It is about a 40-minute drive by car via the N7, R148, and M50 Motorways. The Luas and a number of Dublin Bus routes primarily service the area. Newcastle is an exceptional choice for families of all ages, as it is in close proximity to excellent schools, and many local amenities, yet set back in a tranquil atmosphere. Newcastle homes are traditional in architecture, design, and character. Residences are treated to views of hilltops, leafy terraces, blossoming gardens, well-appointed shrubbery, mature trees, pristine landscaping, and beautiful acreage. Properties retain old-world countryside aesthetics, and one can expect to find styles of Victorian, Red Brick, Terraced, Tudor, country, cottage, modern, and contemporary. New construction and refurbished dwellings are outfitted with modern amenities, tasteful décor, spacious living areas, and sustainable energy efficiency. Many Newcastle homes enjoy privacy and quiet, even though the area is experiencing a growth spurt. Newcastle Village is equipped with many amenities, including retail shopping, pharmacies, supermarkets, convenience stores, banking, post office, health care facilities, and a number of small businesses. The area is also in close proximity to the shopping centres of Rathcoole and Saggart. There are also a number of delicious restaurants, cafes, and pubs. 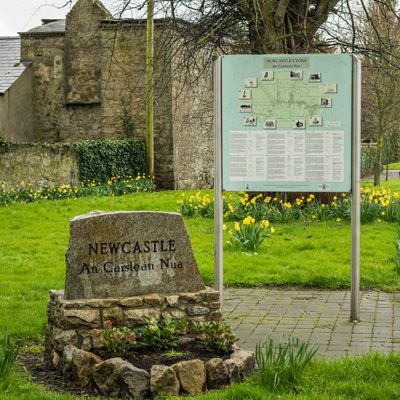 Newcastle is plentiful in sporting and recreational facilities, including St. Finian’s GAA Club, Peamount United F.C, Elm Hall Golf Club, Tollymore Forest Park, Murlough National Nature Reserve, Kilbroney Park, and The Granite Trail. All of which provide ample: walking, cycling, hiking, and picnicking opportunities. Newcastle is host to local primary and secondary schools, including St. Finian’s Primary School, which is also a Scoil learning centre. Academic excellence is a top priority, and school awards include Bord Gais Energy Student Theatre Awards, Junior Dublin Literary Awards, Golden Shamrock Awards, and Community Endeavour Awards. You can filter Newcastle properties by price, bedroom size, square footage and more. There is also the option to filter by a property must-have, such as a fireplace if you are seeking a house to buy in Newcastle where you can enjoy a cup of tea in front of an open fire, or even an attic or an ensuite. You can also check apartments for sale in Newcastle if you are looking for something a little smaller. Don't let the perfect apartment, townhouse or house for sale in Newcastle get away. Looking to rent in Newcastle? Search houses for rent in Newcastle and filter by home types, price and size.